With the establishment of Our Lady of Czestochowa in May of 1903, the Poles of North Tonawanda created a marker of permanence in their city. Having a church, more Poles began moving into the area and soon new clubs and organizations were formed, with one of the earliest being the Polish Falcons. 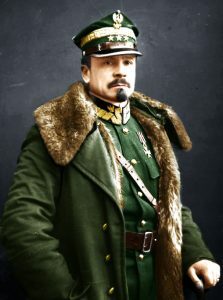 Two branches of the Polish Falcons, the Pulaskis and the Kosciuszkos, formed in the first years of the nineteen-teens. In early 1913, they began raising money and preparing plans for a building of their own, but by the next year the enthusiasm had slowed down. The two groups would eventually joined together forming into the Harmonia Singing Society in 1919. It would be this society that on June 12, 1919 would break ground for the building at 576 Oliver on land purchased from Stanislaus Goscinski. Built by W. M. Miller at the cost of $12,000 the society home was designed to serve as a YMCA for the Polish community of North Tonawanda with an auditorium, lodge rooms, a gymnasium, a library, baths, as well as other amenities. With a building, the society had a place to put on community plays, concerts, and shows. There were also classes held at the club that helped Americanize Polish women, teaching them English, proper cooking, how to sew, and keep a house. Seeing the success that Harmonia was having, the Knights of St. Casimer offered a merger between the organizations, which was approved December 5, 1921 and the group changed its name to Stow Obywateli Domu Polskiego, Inc. or the Dom Polski. From small meetings to large rallies, the Dom Polski was the civic center of North Tonawanda’s Polonia. Of all the noteworthy events held at the Dom Polski, one of the most celebrated was General Joseph Haller’s 1940 visit to the Lumber City. On April 5, 1940 Haller visited North Tonawanda as part of tour in support of the Polish Relief Fund. North Tonawanda gave him over 25 of her boys to command in the First World War and he was a well respected figure in the community. The rally at the Dom Polski began at 8 PM with a greeting of salt, bread, and roses from the schoolchildren of OLC. Once the rally began, Walter Zdrojewski president of the Dom Polski gave the opening remarks followed by Father Walek of Our Lady of Czestochowa Church. Finally the general gave his address, speaking about the atrocities Poland suffered under the Nazi blitzkrieg while also saying that there was hope with “the forces of England, France, the Polish army in France and Canada are pledged to fight totalitarianism to the death to remove evils from the earth.” The evening concluded with the singing of “Jeszcze Polska Nie Zginela” as the general signed autographs and posed for pictures. Despite its Polish origins, the Dom Polski was popular amongst the non-Polish population of North Tonawanda as well. The North Tonawanda Volunteer Firemen’s Benevolent Association, local labor unions, and both the Democratic and Republican parties of North Tonawanda used the hall. 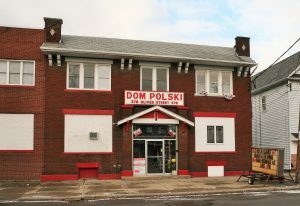 Today the Dom Polski is still a vital part of North Tonawanda’s Polish American community offering an annual Dyngus Day celebration and frequent Polish dinner parties. "Class in Americanization for Women Are Organized." The Evening News [North Tonawanda, NY] 25 Oct. 1920: 1. Print. “Certificates Filed With County Clerk." The Evening News [North Tonawanda, NY] 10 Feb. 1914: 1. Print. "Chopin Singers Plan Concert in PJHS." Tonawanda News [Tonawanda, NY] 27 Mar. 1979: 4. Print. "Club House to Cost $12,000." The Evening News [Tonawanda, NY] 12 June 1919: 4. Print. Conner, Shirley. "Area Laborers Support Spaulding Strikers." Tonawanda News [Tonawanda, NY] 10 Aug. 1976: 7. Print. "Do You Remember?" Tonawanda News [Tonawanda, NY] 19 Oct. 1978: 11. Print. "Dom Poiski Club Is Social Hub of Polish Folk in Lumber City." Niagara Falls Gazette [Niagara Falls, NY] 19 Oct. 1958: 4-C. Print. "Dom Polski to Observe Its Golden Anniversary." Tonawanda News [Tonawanda, NY] 4 Sept. 1969: 4. Print. Dziomba, Stephen. "Big Banquet to Commemorate Dom Polski's 25th Birthday." The Evening News [North Tonawanda, NY] 14 Jan. 1947: 1+. Print. "Entertainments to Swell Building Fund." The Evening News [Tonawanda, NY] 16 Oct. 1920: 4. Print. "Gen. Haller Says Treachery of Hitler In Poland Shows Evils of Dictatorships as Never Before." Tonawanda Evening News [Tonawanda, NY] 5 Apr. 1940: 1+. Print. Litwin, Steve. "Dom Polski - North Tonawanda, NY." Dom Polski - North Tonawanda, NY. Roots Web, 23 Feb. 2013. Web. 19 Jan. 2017. Notice. The Evening News [Tonawanda, NY] 26 May 1919: 3. Print. "NT Democrats Hear Praise Of New Community College." Tonawanda News [Tonawanda, NY] 27 Jan. 1964: 11. Print. "Polish Falcons Raising Funds to Build A Home." The Evening News [North Tonawanda, NY] 7 Mar. 1917: 1. Print. "Real Estate Transfers." The Evening News [Tonawanda, NY] 24 Dec. 1919: 4. Print. Republican Mass Meeting. The Evening News [North Tonawanda, NY] 3 Nov. 1922: 6. Print. "Start Fund For A Home." The Evening News [North Tonawanda, NY] 29 Jan. 1913: 1. Print. "Volunteer Firemen to Elect Directors." The Evening News [North Tonawanda, NY] 21 Dec. 1920: 1. Print. "Will Erect Club House." The Evening News [North Tonawanda, NY] 18 Oct. 1913: 1. Print. Witul, Gregory L. "Old U.S Flag Tells Tale of Haller's Blue Army in NT." Am-Pol Eagle [Cheektowaga, NY] 19 June 2014: 11. Print.